It is usual for graphics card manufacturers to release a best-in-class GPU and then follow it up with a cheaper model that is able to address more of the premium market. Nvidia followed such an approach with the GTX 1080 and then reinforced the Pascal gaming message with the GTX 1070. 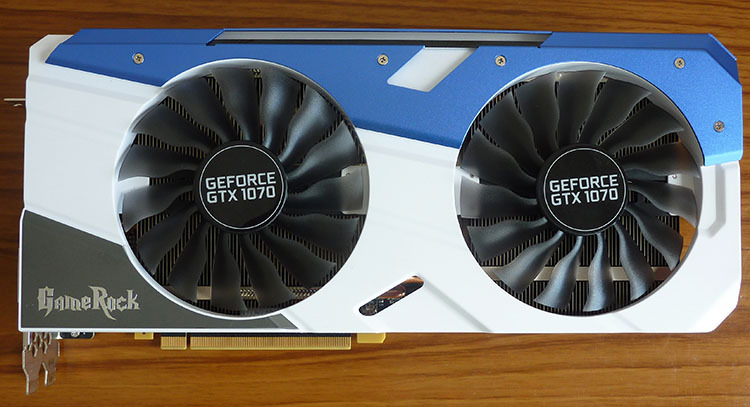 Partner cards from both GPUs remain in stock constraint, and though we have seen our fair share of aftermarket GTX 1080s, the less expensive GTX 1070 has yet to go under the microscope. Nvidia's add-in card (AIC) partners are likely to use the same cooler the and heatsink on both models, so if the company has a 'Hero Champion X' version of the GTX 1070 and GTX 1080, chances are it will look identical save for the differences in the underlying memory and GPU. It will not surprise you to learn that Palit is doing just this with both GPUs. Its GTX 1070 and GTX 1080 offerings are split into three families: GameRock, (Super) JetStream and Founders Edition. What's new here is the introduction of the GameRock sub-brand, which becomes the premier model by supplanting the Super JetStream you should be familiar with from previous reviews on HEXUS. So what exactly is GameRock? Good question. Here is the new cooler on top of the GTX 1070 GPU. GameRock is available in standard and Premium Edition (PE) guises, with the latter in for review today. Though both use the same cooler, the specification differences are telling. The PE clocks in at 1,671MHz core alongside a guaranteed boost speed of 1,873MHz, comparing very favourably with the 1,506/1,683MHz speeds of the Founders Edition. What's more, Palit also overclocks the memory, from 8,000MHz to 8,500MHz. This, then, is a GTX 1070 pushed hard. The main reason why Palit is able to coax both clocks up way past reference has to do with the cooler. It's simply massive, measuring 285mm long, 133mm wide (longer than the normal backplate) and 46mm high, thus taking up the two-and-a-half-slot form factor, or, really, three slots if you want to install something useful in the third. And at 1,188g, make sure it's screwed in well. Such cooling extravagance is at odds against the 150W base TDP of the GTX 1070, though the elevated clocks push the GameRock to 170W. The card uses an eight-phase PWM for the GPU, up from five on the reference board. Two 10cm fans, which switch off at temperatures below 55°C or so, sit on top of a revised cooling solution that's bigger and beefier than ever. Unlike most competitors, Palit uses two separate heatsinks - for the GPU/RAM and VRMs, respectively - and joins them via three super-thick heatpipes snaking out to the right-hand side as you look at the above picture. The left-hand cooling isn't so elaborate, with two thinner heatpipes in a U-shaped formation. All five meet at the middle and connect to a copper base and the GPU. Palit has used a similar solution before, and going by the excellent noise levels present on those cards, it's a brute-force solution that works well. 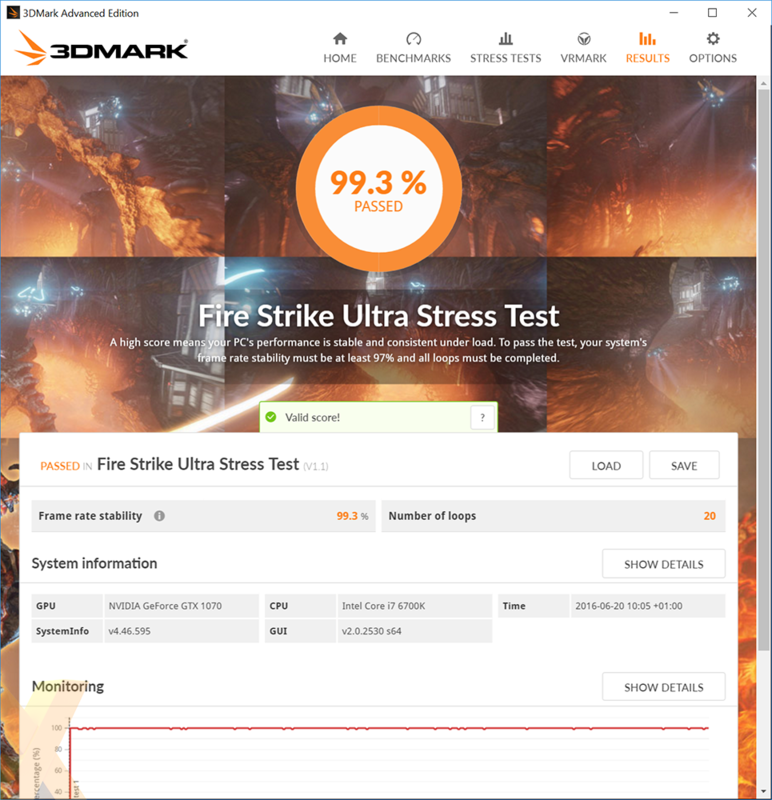 So well, in fact, that the sample card scores an impressive 99.3 per cent in the 3DMark stress test, meaning its performance is very consistent across time. We measured a rock-solid core boost speed of 2,025MHz during testing, as well. You can't release a high-end card these days without having it full of RGB lighting. Indeed, we're struggling to think of a GTX 1080 or 1070 card without it. 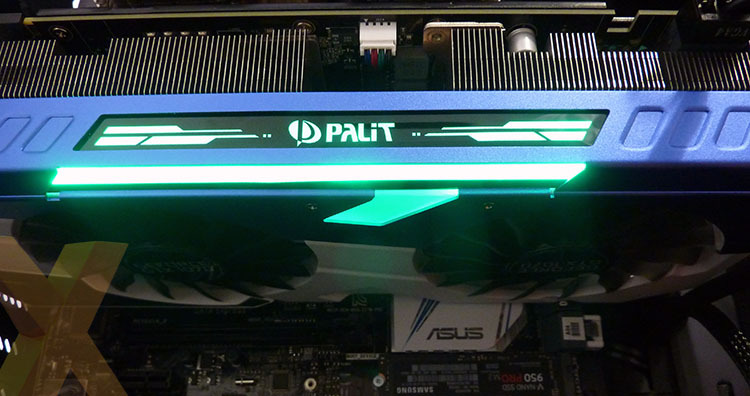 Palit's RGB interpretation has LEDs hidden behind the nameplate section. Lighting spills over to the thin strip above and by default the colour is dictated by the temperature of the GPU - green for coolness and red for hotness. The LEDs displays up to 16.8m colours and can be set to 'still' or 'rainbow' via the ThunderMaster utility that also controls the frequencies when overclocking manually. RGB colour transitions are reasonable, if not seamless. Leaving scope for further overclocking is the eight-pin power connector that offers a total of 225W, and Palit has a two-position slider to enable a second BIOS, which can be useful if you're trying custom BIOSes for higher speeds. 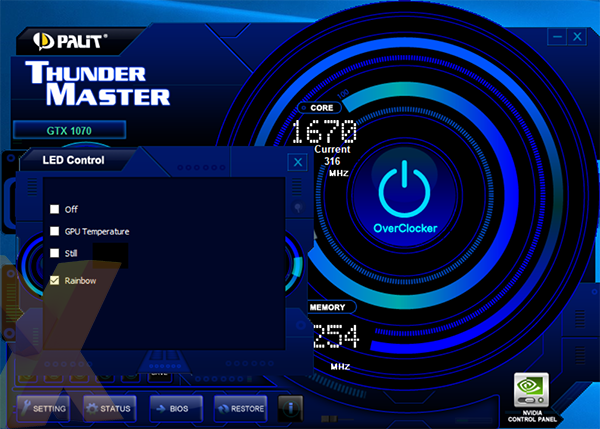 The aforementioned ThunderMaster utility also offers a means by which to add a second BIOS easily. There's also the now-obligatory rear heatsink/plate. We're not huge fans of the overall aesthetic of this card - the blue and white colour scheme isn't the most pleasing, while the rear logo seems like a blast from the past. Palit sells a large quantity of its product into the Chinese market, so we guess the styling is a nod towards what works there. The rear IO panel is standard for a 10-series card, so three DisplayPort, a single HDMI and dual-link DVI. Palit says the new honeycomb ventilation increases airflow by 15 per cent, though we're sure they mean that a significantly larger proportion of air is expelled outside the chassis; only the fans can dictate airflow. The relative size of the card can be gleaned from looking at the comparatively small footprint of this standard-sized bracket. 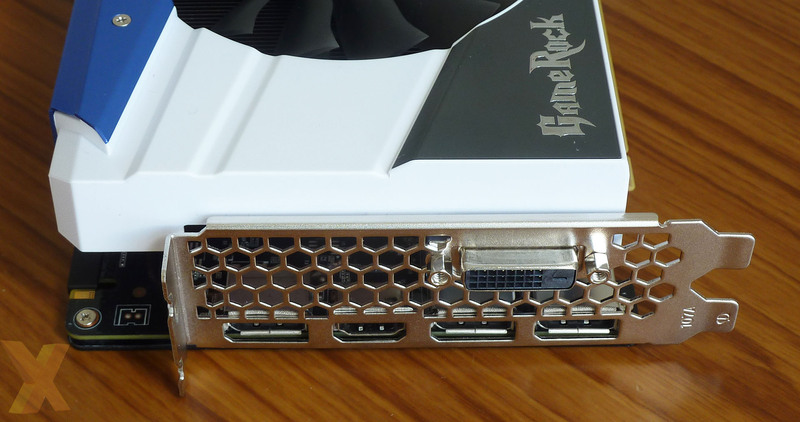 Palit's GTX 1070 GameRock PE is currently on pre-order for £400, meaning it attracts a sub-10 per cent premium over the very cheapest GTX 1070s on the market. The difference between this card and the GTX 1080 variant of the same name is a considerable £220, though if you want to compare against the competition, do be aware that Palit's standard warranty is two years, not the three applied to most other manufacturers' cards. Being the first non-reference GTX 1070 card in our tests, let's now see if it can deliver in the benchmarks.